Quick, easy, delicious... and elegant. These terms don't often go hand-in-hand. In fact, some may consider them polar opposites when it comes to cooking a meal... but they don't have to be. So much of what's very simple can also be exquisitely elegant. This particular dish is a perfect example. It's so incredibly quick and easy to prepare. It's almost as easy as opening a can of beans. And while I'm definitely not a trained photographer, I hope this photo gives you an idea of just how lovely a plating this humble little fish makes. It's an equally perfect choice for a busy night when you need something fast, or for guests when you want something special. And, it's a dish that comes together just as easy for a group of six as it does for just one. The trick: foil. The only limitation: your imagination. I've used this method with several types of fish and especially like it with tilapia, cod, or halibut. (It also works well with chicken... you just need to bake it longer to ensure that it cooks through.) Basically, each serving of fish cooks up in its own foil pouch -- making prep and clean up a breeze -- and you can add just about any veggie or seasoning you'd like. The only must is that you add a bit of liquid (dry white wine and fresh lemon juice are particularly good) so that you create a bit of a broth that works to keep the fish moist and wonderfully flakey. You simply cut a strip of foil for each piece of fish you are preparing -- one that will easily wrap up and around an individual serving; smear a dab of unsalted butter in the center of each piece of foil; position your fish fillet over the buttered center of the foil and pull up the sides to create a bit of a bowl; drizzle each fillet with your "marinade" of choice; toss in a few veggies (if you'd like); and sprinkle in a few of your favorite seasonings. Once you're happy with your creation, wrap it all up to seal in the fixings. 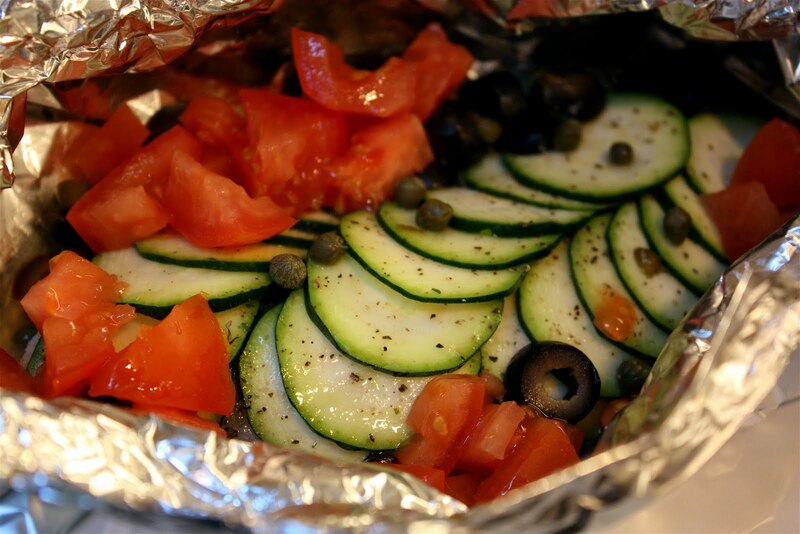 Place your foil packets in a baking dish and pop them in the oven for a quick bake/steam. This foil-baked fish takes on a bit of the flavors of Provence with the addition of capers, black olives, red pepper flakes, white wine, lemon, garlic, and parsley. To dress it up a bit (get that little elegant quotient going), I arranged a layer of thinly sliced zucchini across the surface of each fillet. You can do the same, or simple dice up your veggie and pop it into the pouch. 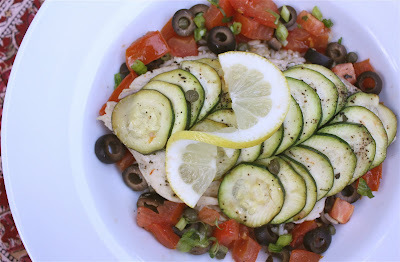 As shown: serve over a bed of long-grain brown rice (follow package directions). 1. 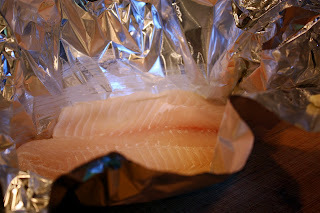 Preheat oven to 350 degrees F. Cut a length of foil for each fillet (enough to easily wrap up and around each piece of fish and seal). Smear 1 tablespoon unsalted butter into center of each piece of foil and position fillet on top. Bring sides of foil up to create a bowl around fish. 2. Pour 1 1/2 tablespoon dry white wine and 1 teaspoon freshly squeezed lemon juice over each fillet. Sprinkle each fillet with a little salt and pepper; top each with half the zest, basil, parsley, garlic, black olives, tomatoes, green onion, capers, and red pepper flakes. Push toppings off top of surface of each fillet to make room for layer of zucchini. Arrange zucchini slices in an artful manner over each fillet. 3. 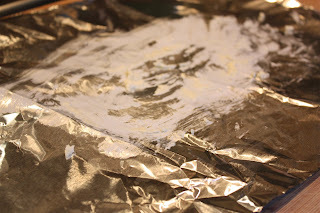 Bring sides of foil up to meet in the center; fold and seal together. Seal each end of pouch to fully enclose fish. Place fillets in a large baking dish and put in oven to bake for approximately 30 to 40 minutes, depending on thickness. 4. Carefully open each fillet pouch. Plate individual servings by placing a spoonful of rice in center of shallow bowl. Carefully remove fillet from pouch with a spatula; set aside (keep it on spatula). Pour juices and toppings around rice; top with fillet. Continue with additional platings. Serve immediately.